We weren’t sure how excited to be for our recent trip to Cambodia. 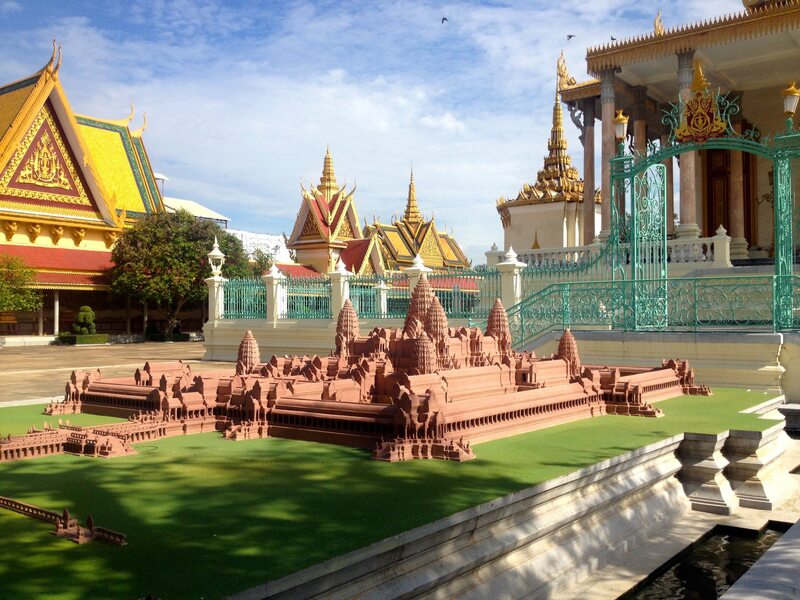 We spent 7 nights there (3 in Phnom Penh and 4 in Siem Reap), and were seriously questioning our decision to go to Phnom Penh based on a few blog posts we read before arriving. 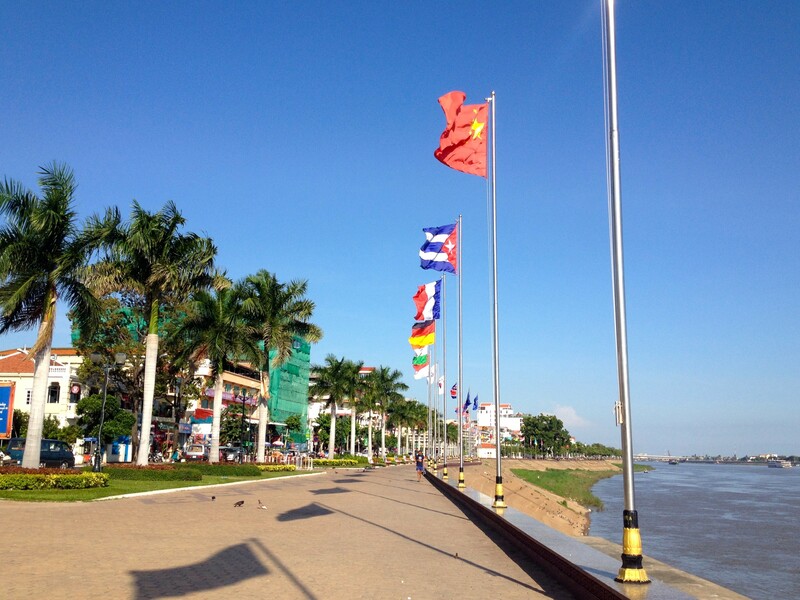 We read through various accounts of purse snatching in Phnom Penh and one story about a woman having to shell out $200 to get her dropped iPhone back from a stranger. We even read one account of a French woman who was killed when a thief attempted to grab her bag, dragging her into oncoming traffic. 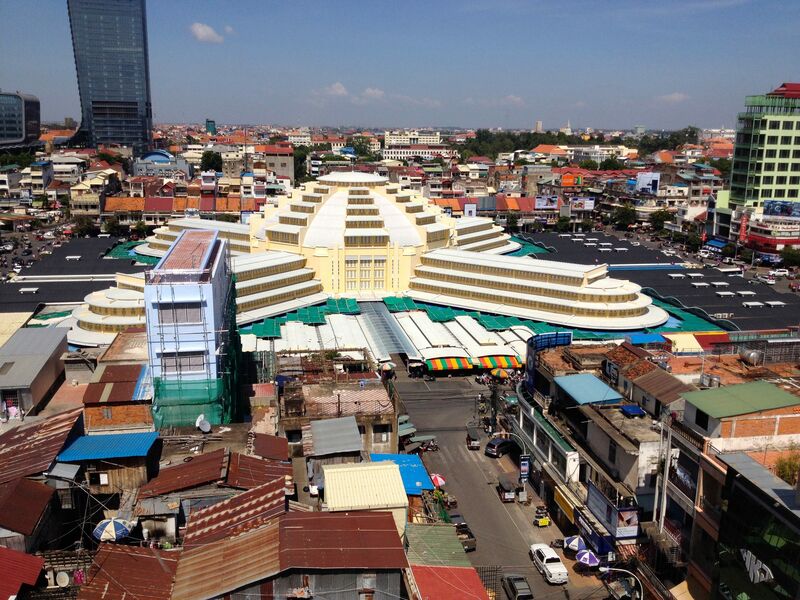 From what I gather, Cambodia has changed in the last few years. After an initial upswing in tourism while the country recovered from decades of violence, it now seems to be getting a little rough around the edges. 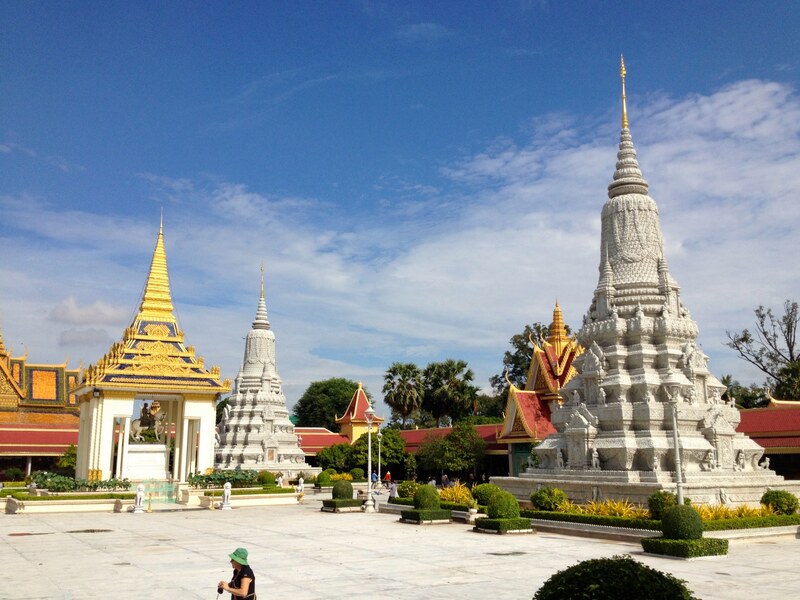 While it’s not our top choice destination in Southeast Asia (Thailand will always hold that title with us! ), it was definitely worth the trip. 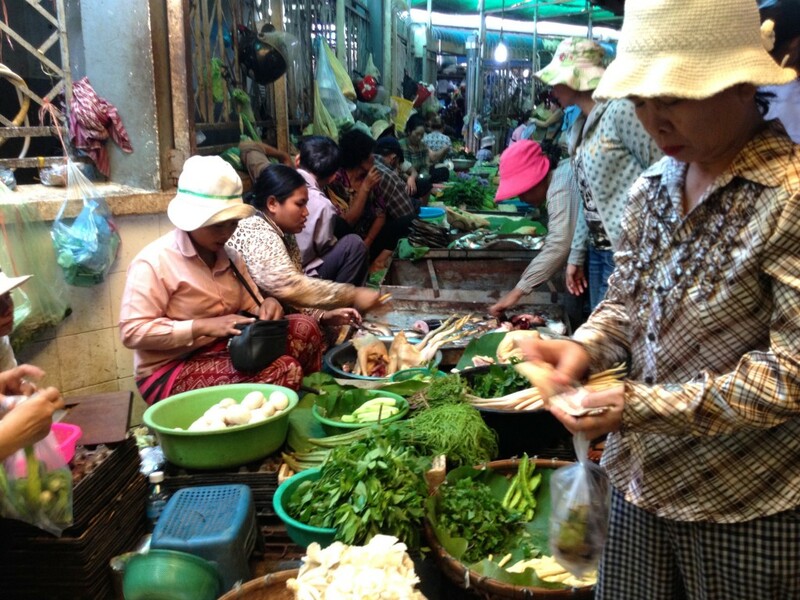 When you visit Cambodia, you’ll learn about its years of violence and civil war, you’ll be warned repeatedly about the active land mines still scattered across the countryside, and you will likely see poverty almost everywhere you go. But you’ll also meet tons of wonderfully friendly Cambodian people who are making the most of life, especially considering they’ve been to hell and back in the last few decades. Safir, Our Tuk Tuk Driver. 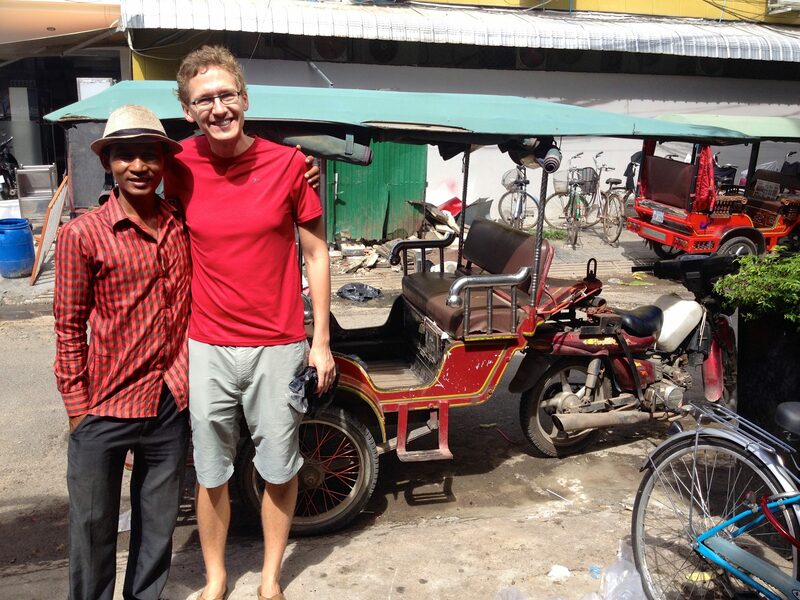 One of the Friendliest People You’ll Meet in Phnom Penh! 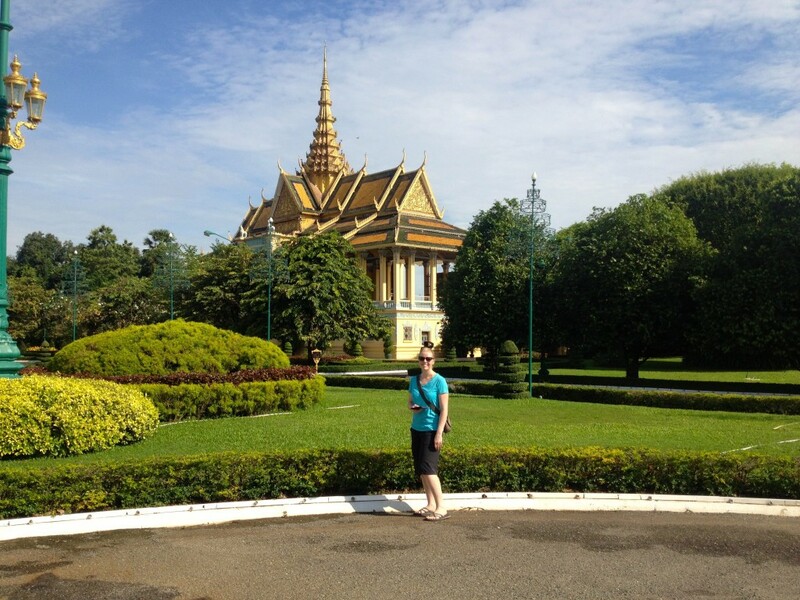 Fortunately for us, we had a great trip to Cambodia. We were borderline paranoid about our safety, but I think it was for good reason. Our taxi driver that drove us from Phnom Penh airport warned us about purse snatchings after dark, as did our hotel staff, as did all the travel books. We managed to escape without any safety scares, though we did meet an Expat from Sydney in Siem Reap who had just been mugged! 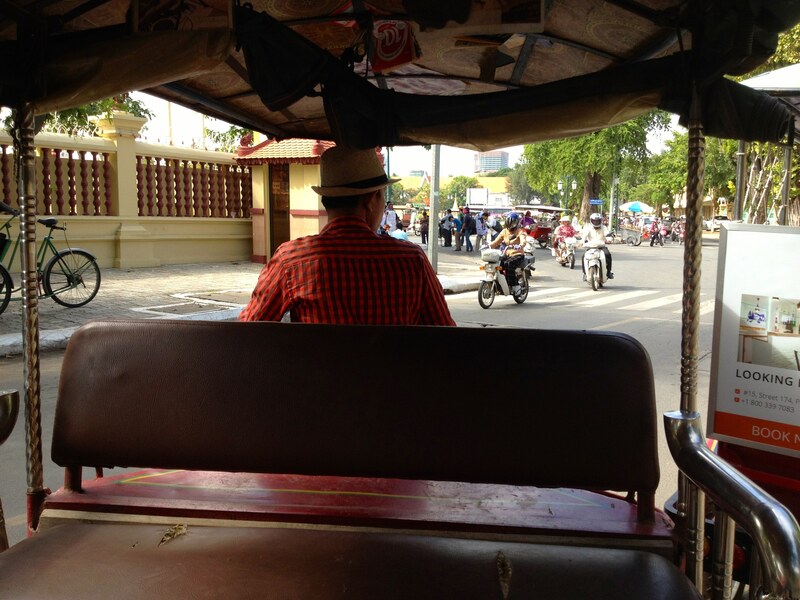 We enjoyed our time in Phnom Penh, though we think anything more than 3 nights would have been too much time there. 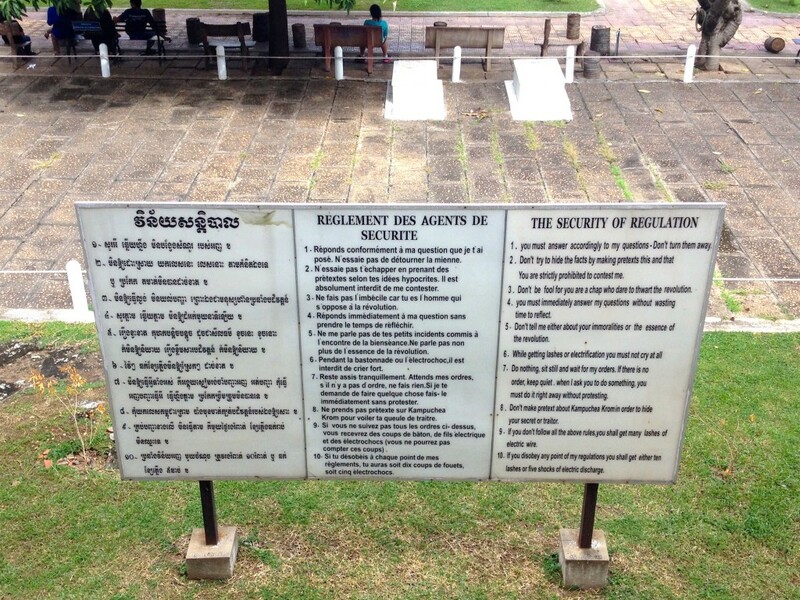 Alright, on to the interesting stuff – what did we do in Phnom Penh, anyway?! 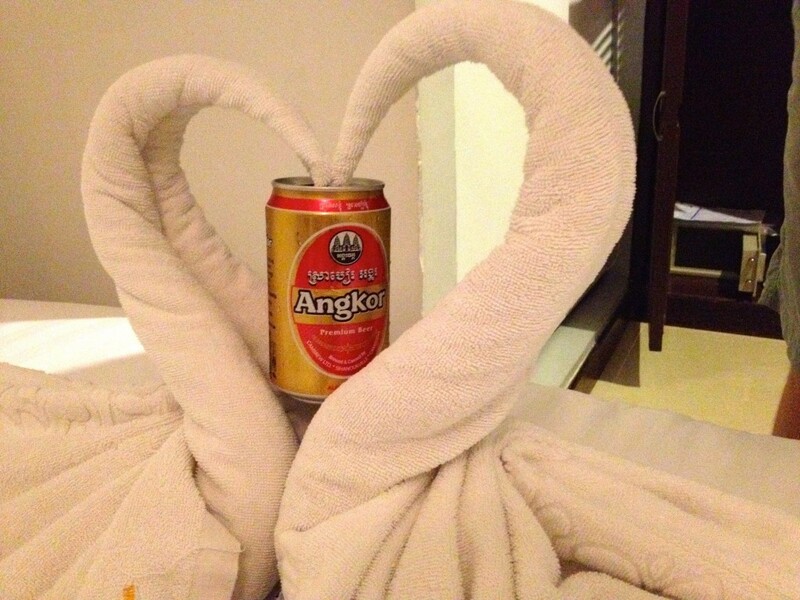 Beer in Cambodia costs about half as much as beer here in Chiang Mai. They also have WAAAAAAYYYY more variety – most stores have locally brewed stouts or other dark beers! Naturally, we drank a lot on this trip, because seriously WHO can resist a fifty cent beer, AMIRITE? 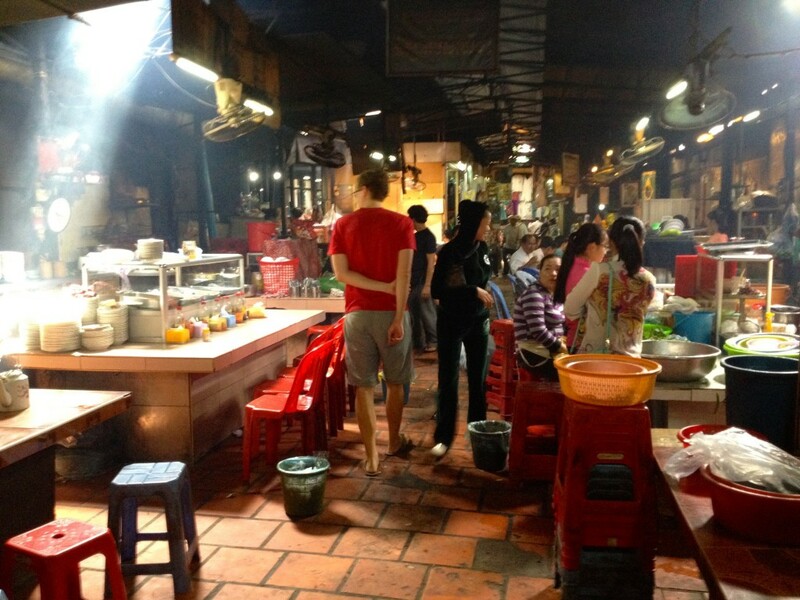 The Russian Market is named as it is because it was mostly frequented by Russian Expats in the years following the Khmer Rouge rule. 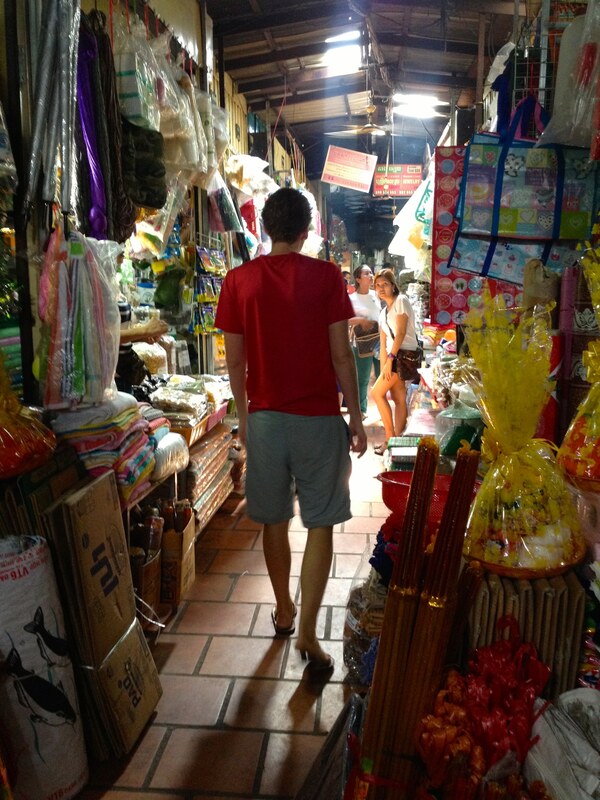 Now, it is THE place to go to find almost anything. 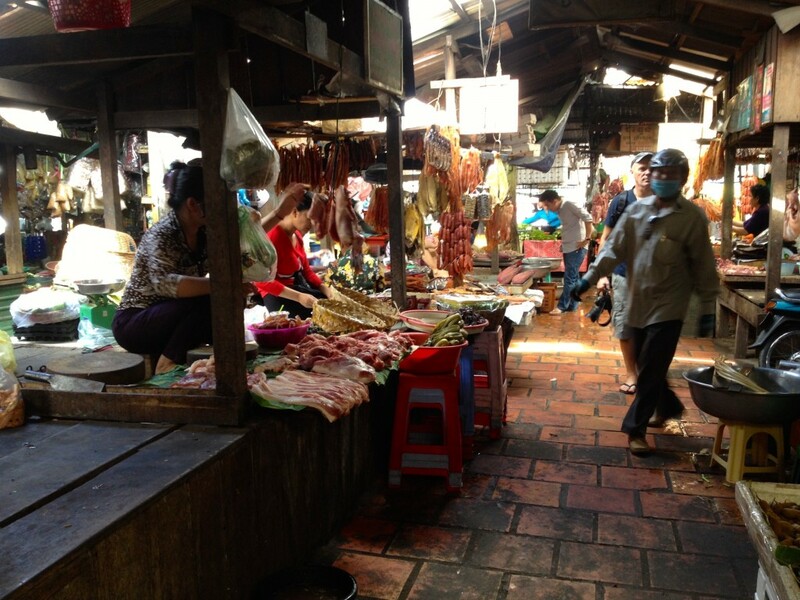 Stalls here sell everything from counterfeit money to peppercorns to raw meat to name brand clothing to noodle dishes. The Bulk Foods Section! 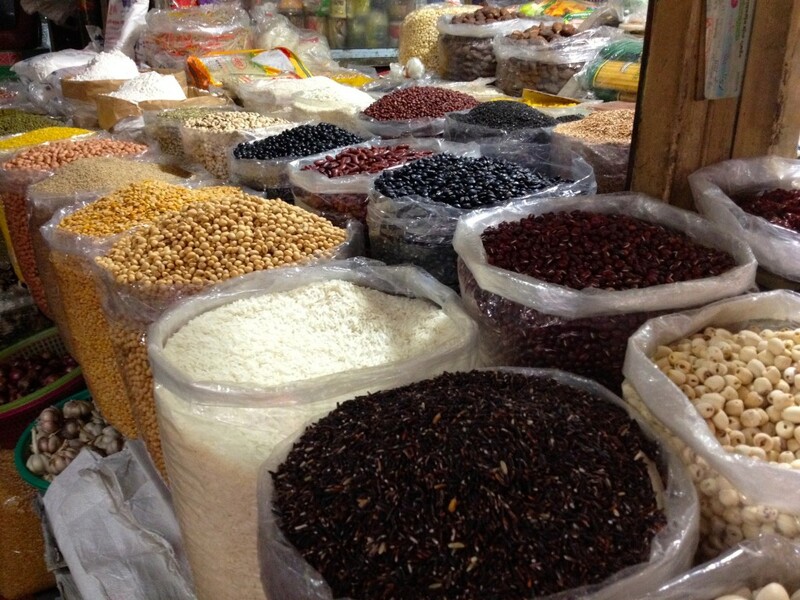 I Am a Sucker for Bulk Foods! We read that most of the clothes on sale here are indeed genuine, and are from the various clothing factories around Cambodia. I needed a new bikini, which I easily found for just $8, and Kevin got a couple t-shirts for a couple bucks apiece. Fun fact: if you need to try something on, you either do it over the clothes you’re wearing, or you wrap yourself up in a sarong and try not to moon anyone! 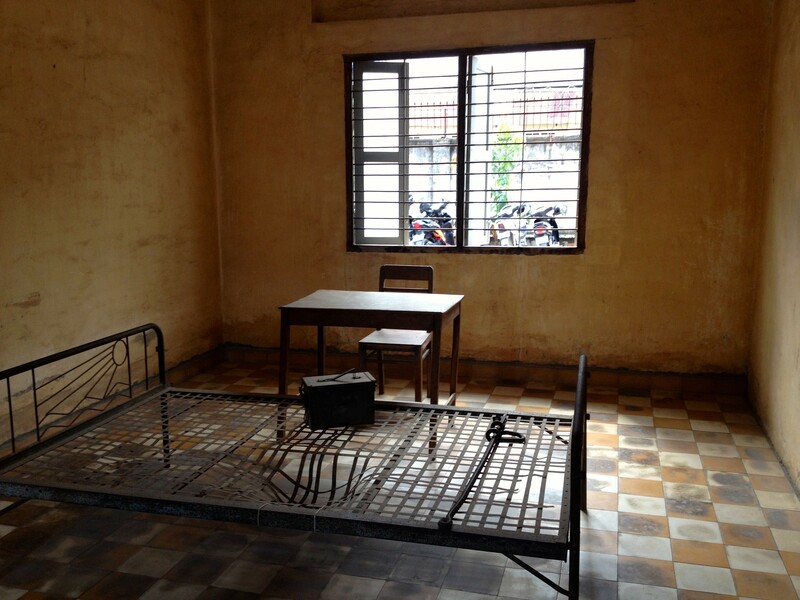 Our day turned in a very somber direction when we visited the Toul Sleng Genocide Museum, sometimes referred to as the S-21 prison. The building was a former high school which was taken over by the Khmer Rouge in the mid 70s, and was used to imprison and torture people opposed (or even suspected of being opposed) to the Khmer Rouge rule. It’s reported that as many as 20,000 of the people imprisoned at S-21 were later murdered, including 2 Americans. If you don’t know much about the Khmer Rouge period in Cambodia’s history, I recommend picking up a book my friend Sarah recommended to me called When Broken Glass Floats by Chanrithy Him. Written by a woman who was a young girl when the Khmer Rouge came to power and started their harrowing rule, this book gives insight into what it was like to live under such a cruel regime. A visit to S-21 will undoubtedly leave you emotionally raw, but we think it’s absolutely a must see. We walked down the quiet hallways, past windows covered with barbed wire, and through cells where prisoners were tortured and beaten. What really got to me, though, were the photos that were taken of each prisoner when they arrived to S-21. 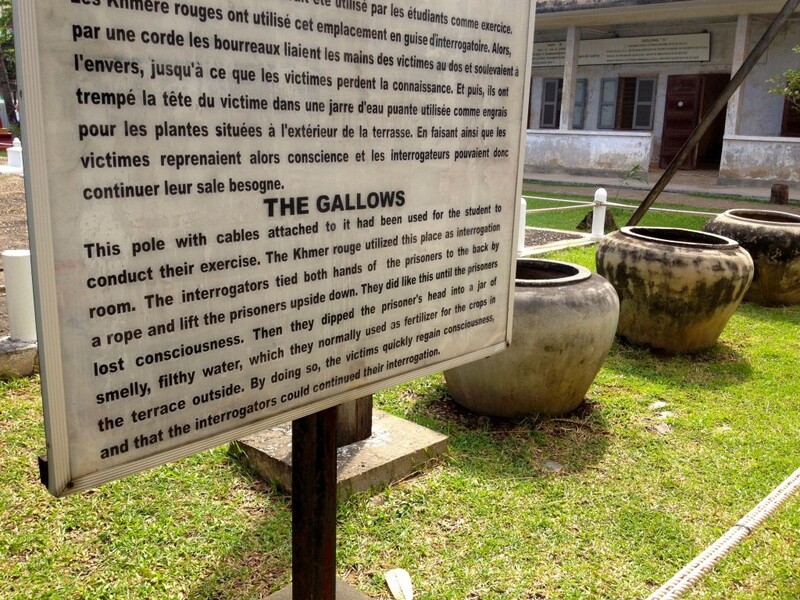 The Khmer Rouge was meticulous about record keeping, and the hundreds and hundreds of photos are a haunting visual of the emotions people were feeling when they were brought here. Normally, I would’ve been pretty impressed by the gilded buildings and sparkly things, but it’s hard to feel excited to see such extravagance when poverty is so apparent just yards away, or when you spent the morning learning about the regime that killed millions of its own people. In stark contrast to the well kept grounds of the palace, many of Phnom Penh’s streets are absolutely littered with garbage. Just one block north of the Royal Palace, entire families are sleeping in the streets. It’s rare to walk anywhere without encountering someone begging for food or money. 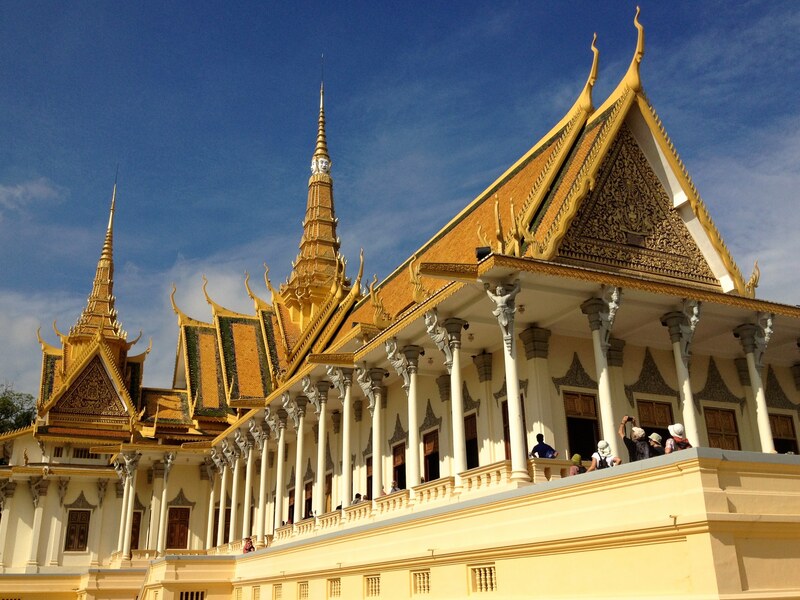 Nonetheless, the Royal Palace is a must-see sight in Phnom Penh, and we recommend making a visit. If nothing else, the stark contrast between what goes on inside and outside of the royal walls will open your eyes to how hard so many people’s lives here still are. 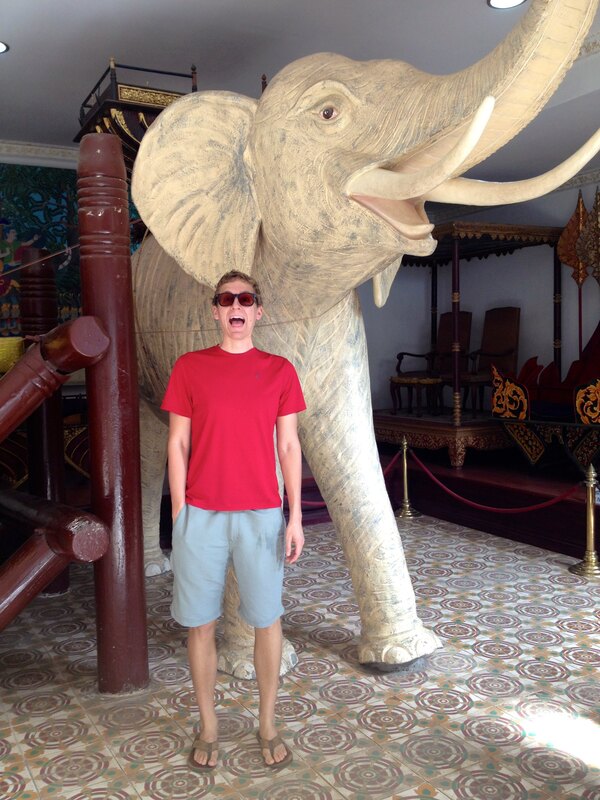 And Here’s Kevin, Pretending to Be an Elephant at the Royal Palace. 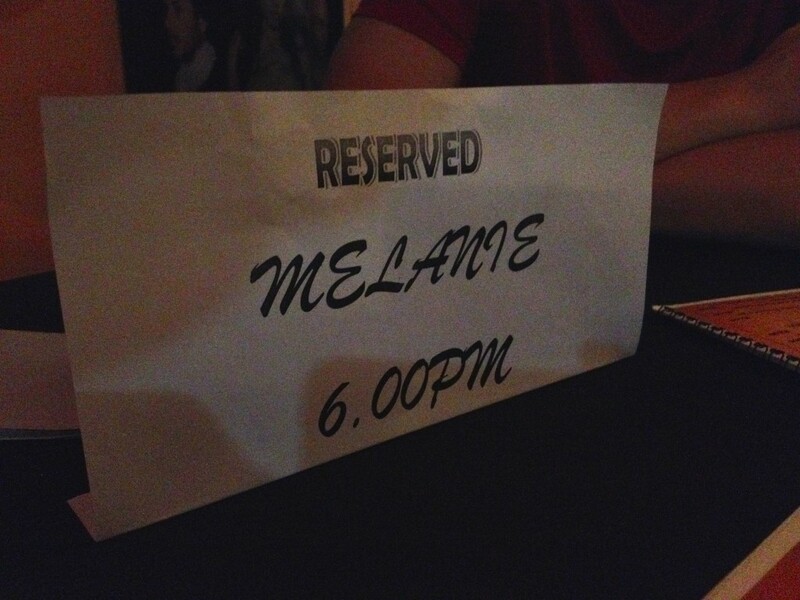 Because That’s How We Roll. 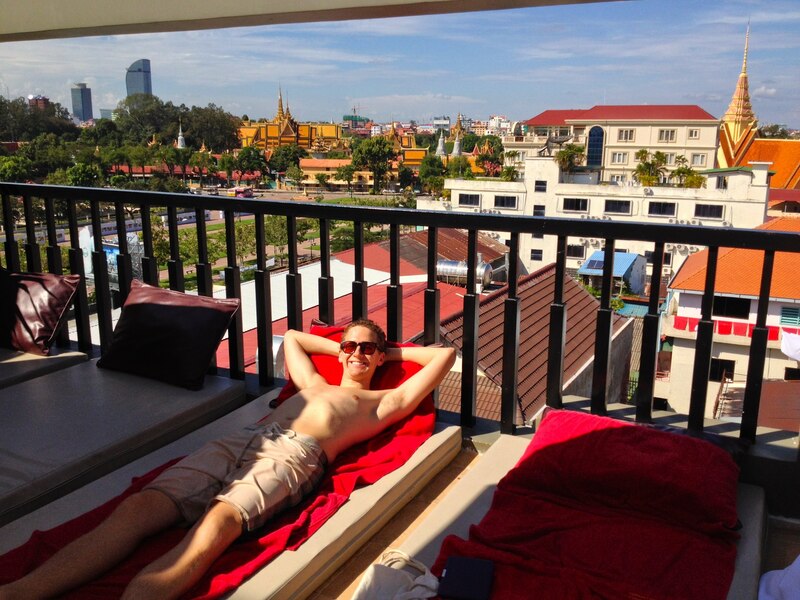 On a lighter note, we did manage to spend a lot of time relaxing at one of the TWO rooftop pools at our hotel. I’m not sure how Cambodia is SO HOT AND HUMID, even in late November when it’s supposed to be “cool season”. If you ever make the trip, Aircon and a pool are a must. 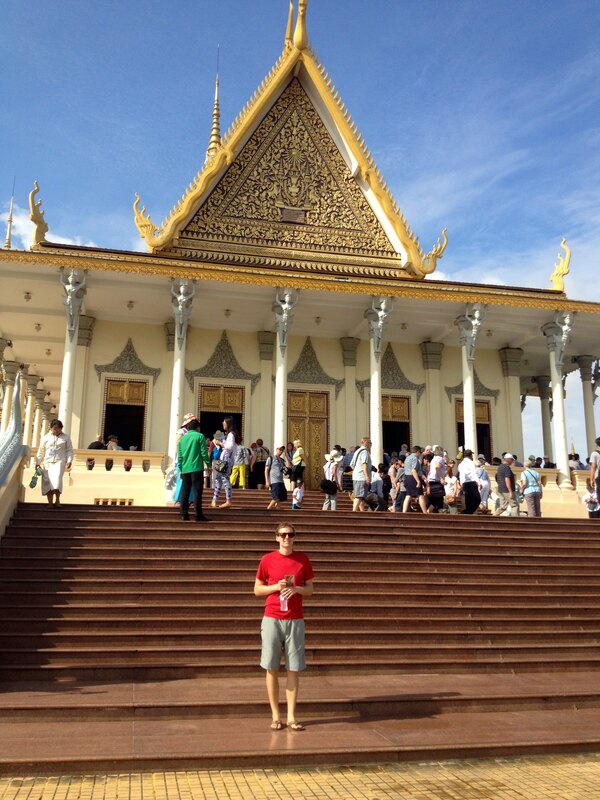 First Stop: Wat Phnom, a Buddhist Temple in the Center of the City. 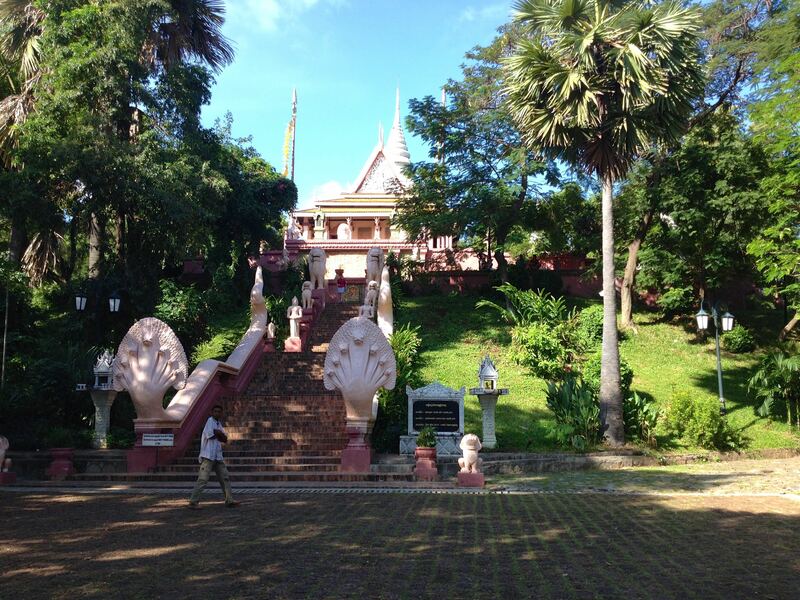 It Sits Atop the Only Hill in Phnom Penh! 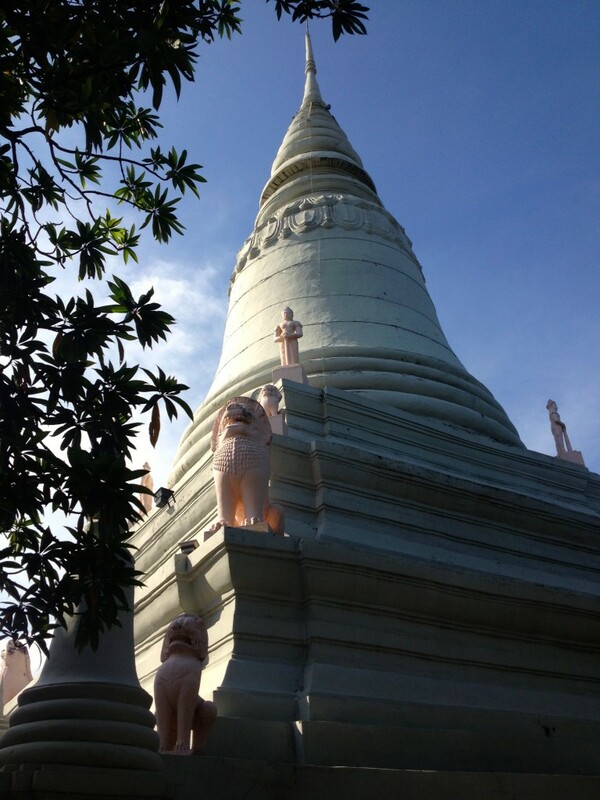 The Chedi at Wat Phnom. I Love How the Lions Look Pink in the Morning Sunlight! 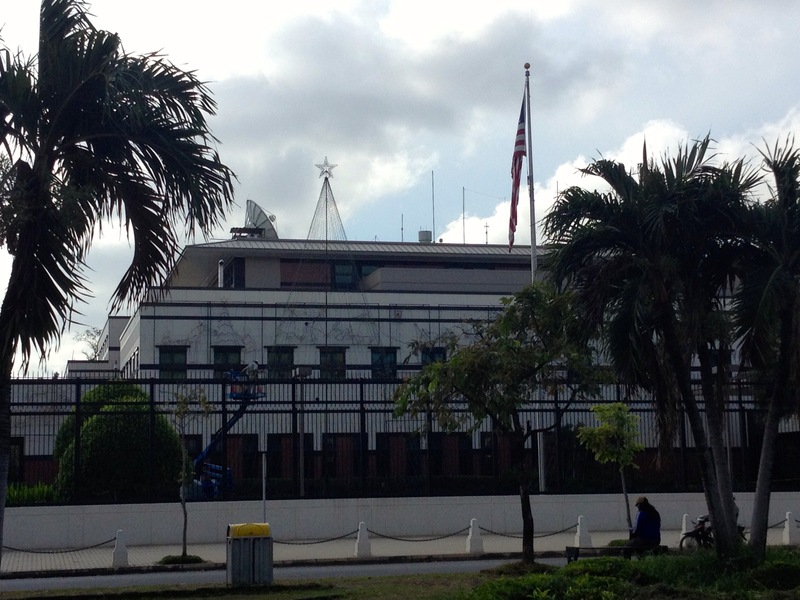 We Strolled past the U.S. Embassy, Where Christmas Lights Were Going Up! 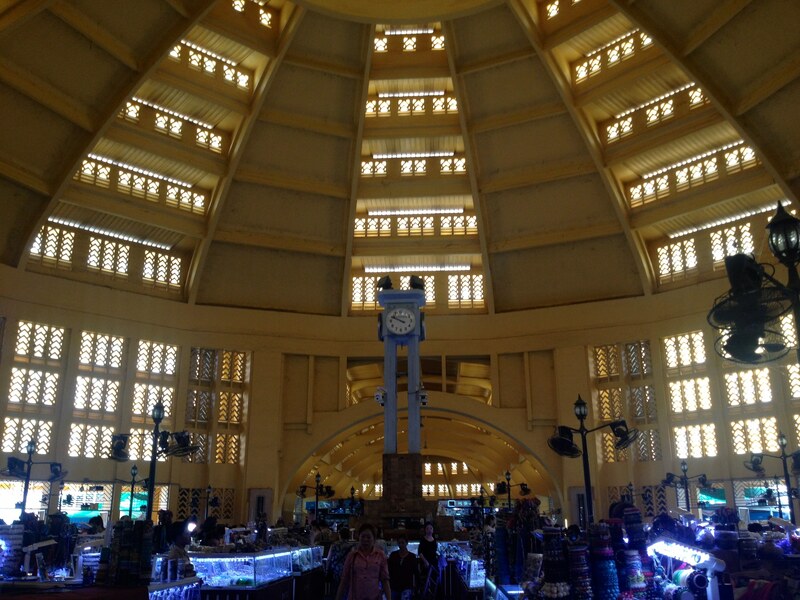 Last Stop, the Central Market. Here’s an Aerial View from the Neighboring Sorya Shopping Center. 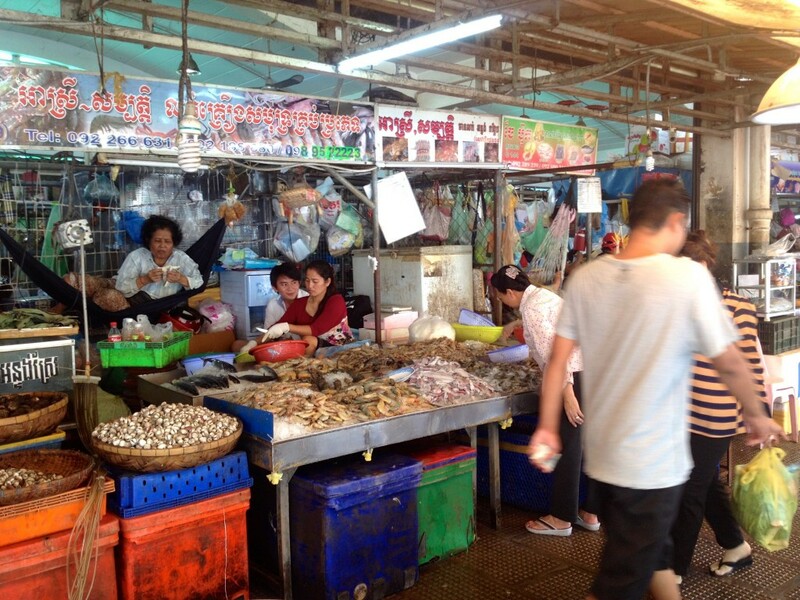 The Materials and Shape Reportedly Make the Central Market Feel Air Conditioned. I Might Disagree… It Was Hot! I Love How This Gal Is Just Hanging out in Her Hammock at Her Seafood Stall. 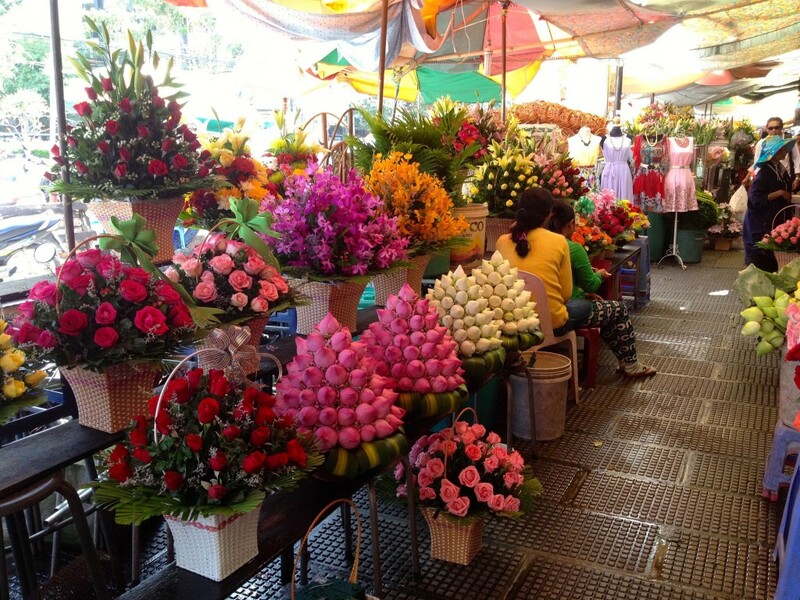 Beautiful Flowers at the Central Market in Phnom Penh. 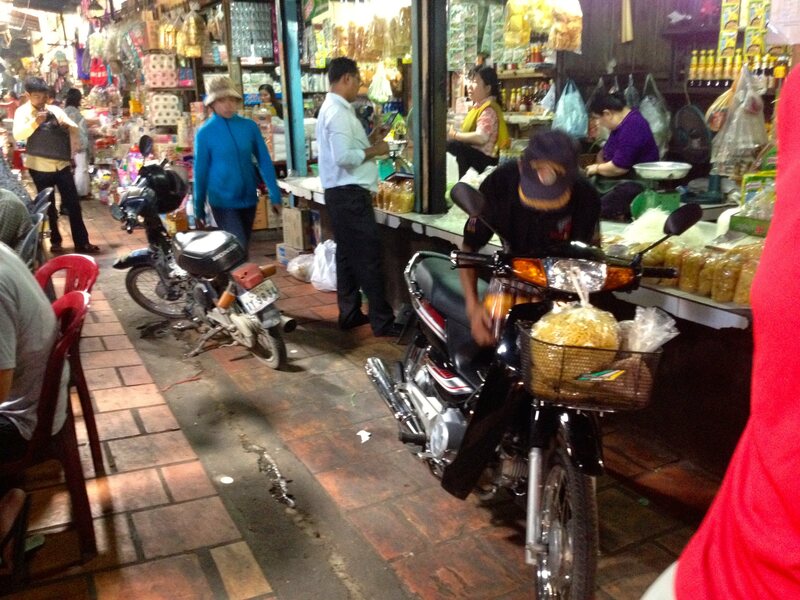 Knowing we would be in Phnom Penh on Thanksgiving, I searched far and wide on the interwebs to find a spot where we could have a Turkey Dinner. Last year, we were in Vietnam for Thanksgiving. And while fish that’s grilled in a banana leaf is indeed delicious, it does not scream traditional Thanksgiving to me. 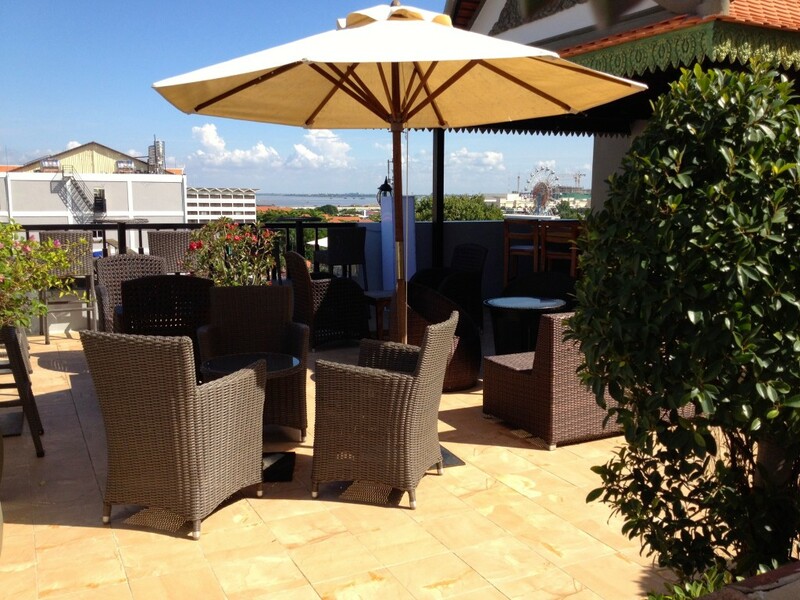 So this year, we got a reservation at Alley Cat, an expat-owned restaurant in downtown Phnom Penh. Like I Said, It Was a Dive Bar. 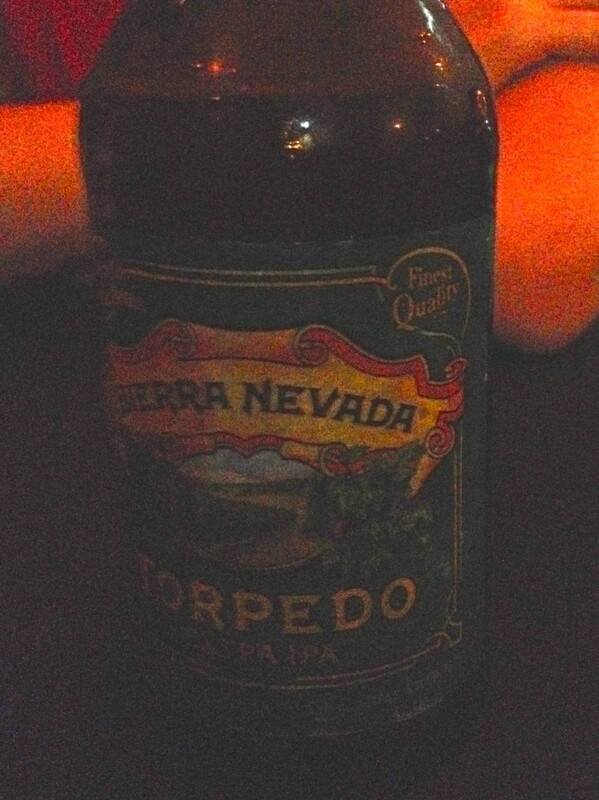 Hence the Dark, Terrible Photo of the Wonderful, Delicious Beer. 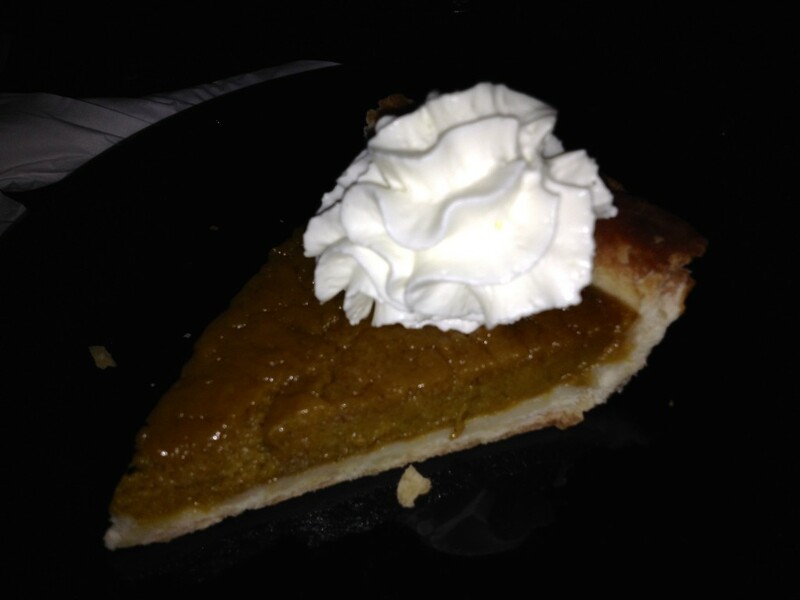 And, of course, it came with pumpkin pie for dessert! We Want to Hear from You! 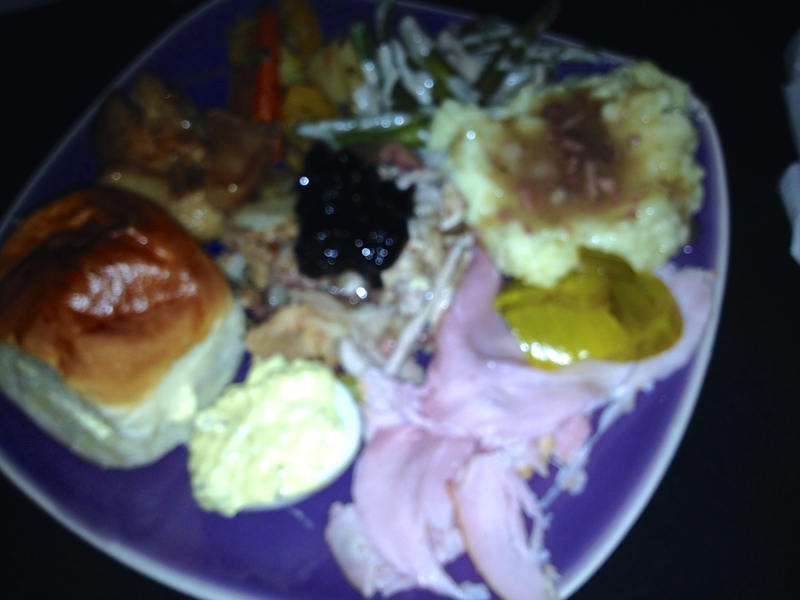 What Are You Thankful for This Holiday Season? After the emotional roller coaster of visiting S-21, seeing the Royal Palace, and witnessing so much poverty on the streets of Phnom Penh, we were walking home from Thanksgiving dinner thinking about how lucky we are. We’re lucky to have such wonderful families and great friends, but we’re also lucky to be born somewhere with so much opportunity. What are you thankful for this Holiday Season? We hope to visit Palawan at some time as well! It was originally on our list when we thought we’d be traveling for two whole years, but we had to compress our plans when we cut our time in half. We decided the Philippines will be a great spot to travel to from Seattle in the future!